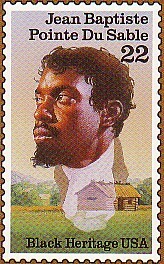 August 28, 1818 Jean Baptiste Pointe du Sable, The Father of Chicago, died. Du Sable’s birth date is unknown but it is generally believed that he was born between 1730 and 1745 in what is now Haiti. Du Sable first arrived on the western shores of Lake Michigan around 1779, where he built the first permanent non-indigenous settlement just east of the present Michigan Avenue Bridge. From 1780 to 1784, he managed a huge tract of woodlands on the St. Clair River. Du Sable also operated the first fur-trading post. He left Chicago in 1800 for Peoria, Illinois and in 1813 moved to St. Charles, Missouri where he died. In 1968, the State of Illinois and the City of Chicago declared Du Sable “the Founder of Chicago” and erected a granite marker at his grave. In 1976, his home site was designated a National Historic Landmark and in 1987 the United States Postal Service issued a commemorative postage stamp in his honor. DuSable High School and the DuSable Museum of African American History in Chicago are named in his honor.